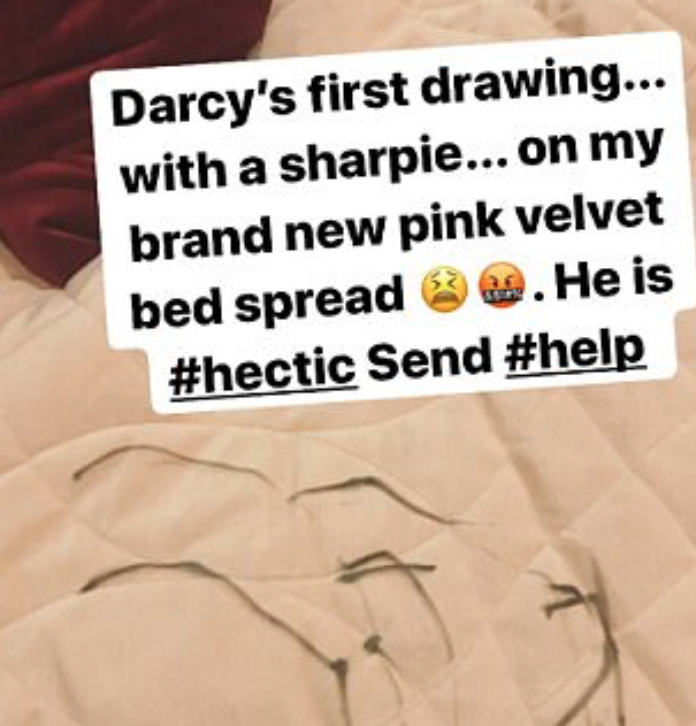 Bec Judd’s nice new bedspread has proven so inviting that her toddler son and his nifty black pen made themselves – artistically – right at home. Sob! Oh yeahhhhh- it’s the @adairs sale event you Linen Lovers have been waiting for- RJL Ophelia bedlinen 40% off (Save $70 QB – was $199.99, now $129.99). Be quick guys 💕💕 Available in ruby red too. Look at that pretty pink bedspread! It’s so new and clean and cushy and lovely. Not only that, Bec actually designed it herself – for homewares chain Adairs – meaning it’s got extra special sentimental value too. Swoon! Obviously all these covetable qualities makes this bedspread the perfect creative canvas for an intrepid toddler. Bec’s son Darcy – and his Sharpie marker – were up for the challenge. Together they confidently and artistically attacked the blanket with bold, black strokes. No matter that the blanket’s pile was plush and the terrain quite thick. Darcy is no quitter. He pushed on and managed quite a number of bold scribbles before he a) wandered off b) got writer’s cramp or c) got sprung by his mum. We’re not sure which. A mortified Bec took to Instagram to share this special moment in her life, in a sort of social media cry-for-help, and we’re sensing it was a “lunatics taking over the asylum” moment of hers. “Darcie’s first drawing with a Sharpie. On my brand new pink velvet bedspread. He is #hectic. Send #help,” she posted in a dismayed and wordy kind of morse-code. TV and radio presenter Bec and husband, AFL player Chris Judd, are parents to six-year-old Oscar, three-year-old Billie and twin one-year-old boys Tom and Darcy. They’re also parents to this now one-off velvet bedspread called Ophelia. We’ll let Bec explain. “I named my latest pink, quilted velvet design for Adairs ‘Ophelia’,” Bec posted to Instagram. I named my latest pink, quilted velvet design for @adairs ‘Ophelia’. After Billie, if we ever had another daughter, that’s what I wanted to call her. My husband said, “No waaaaaaay are we calling our daughter anything that starts with the sounds ‘Oh’ ‘Feel’ 🤣🤣🤣” Alas, we had two more sons and here she is on my bed instead. Also available in ruby red. Shop the link in my profile.